Nah, I kid. It was much better than “OK”. It was cool, slick, epic, and very purple. 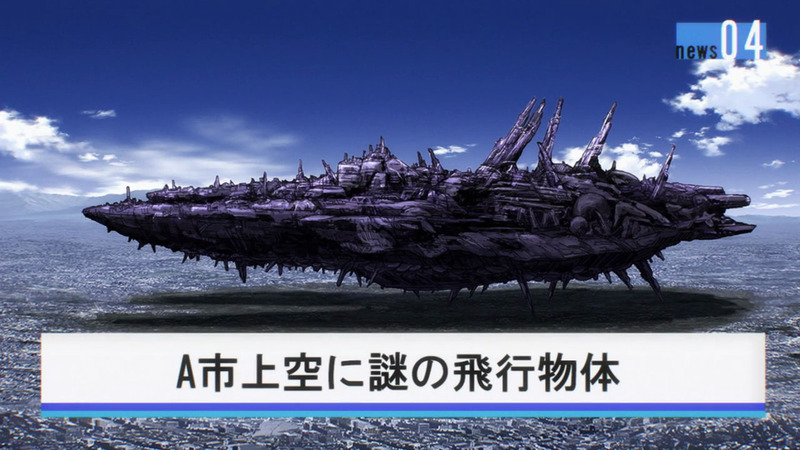 I had seen a lot of people hyping up this final encounter, especially after what went down with the Sea King. Many claimed this would blow that out of the water, so I was cautiously optimistic about what was being set-up. So how did it compare? 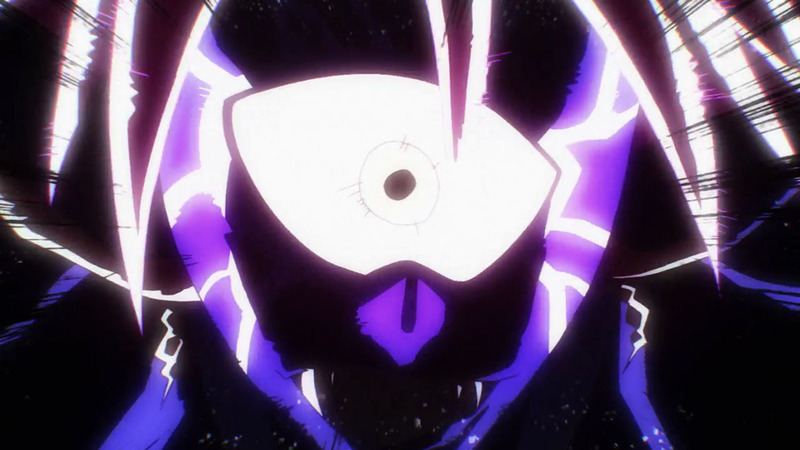 So far, I think the episode 9 is still my runaway favourite – it was just as epic and sakuga-filled as this episode, but that occasion has some real, raw emotions, especially from Mumen Rider. Here, it was all flashes and punches, which is awesome, but it didn’t quite strike the same chord as the Sea King arc. If I was to highlight one irk I had with this episode, it would have to be most of the S-Class heroes failing to impress. I throughly enjoyed their introductions last week, and was expecting them to deliver on the action front, and in a way they did, but on the other hand I was left wanting… more. In fact, it was Iaian who stood out most of all, if only because he spoke the most sense. He faced off against the Meruem-voiced alien last week, so he knew that throwing punches and slashes wasn’t going to work, yet the elites of the Hero Association did just that for the entirety of the episode. Puri Puri did his punches, Atomic Samurai swung his sword, and Bang delivered some slick moves, but it did nothing for me. It took a good while before the “marble” flaw was brought up, and even then it didn’t fully resolve the fight. Honestly, I was expecting more from the S-Class heroes. 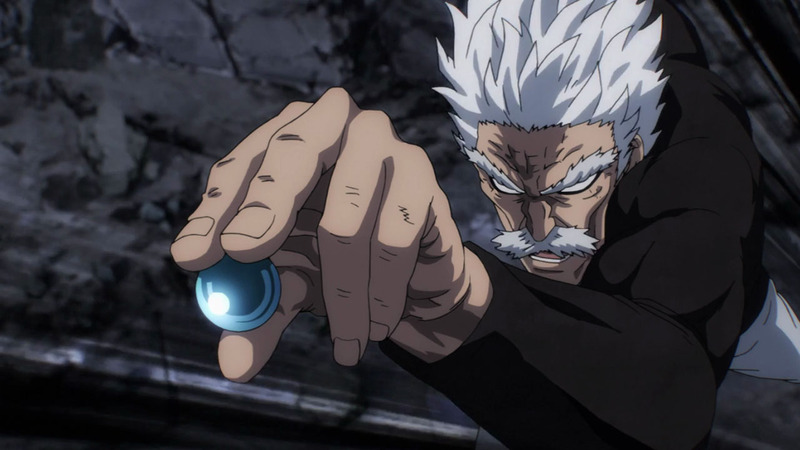 Thankfully, there was one that stood out, and that would be Tatsumaki, who showed why she’s the highest ranked of everyone there. Sure, her abilities are overpowered (at this point it seems like whatever she wills ends up a reality), but her turning all the bullets around was a brilliant moment, and completely overshadowed the efforts of everyone else. If she wasn’t my favourite already, she would be now. So far only her and Saitama have contributed to fighting their alien foes, which is good for me. 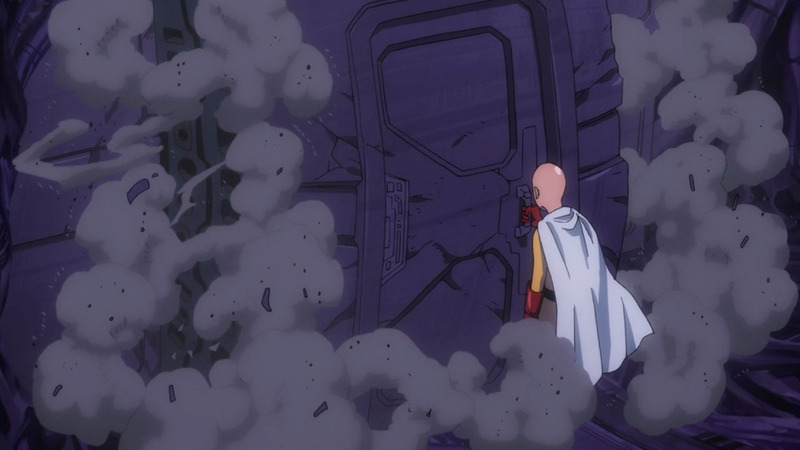 However, I think the highlights of this episode go to Saitama, for running through those corridors, pulling off doors, and getting lost along the way. 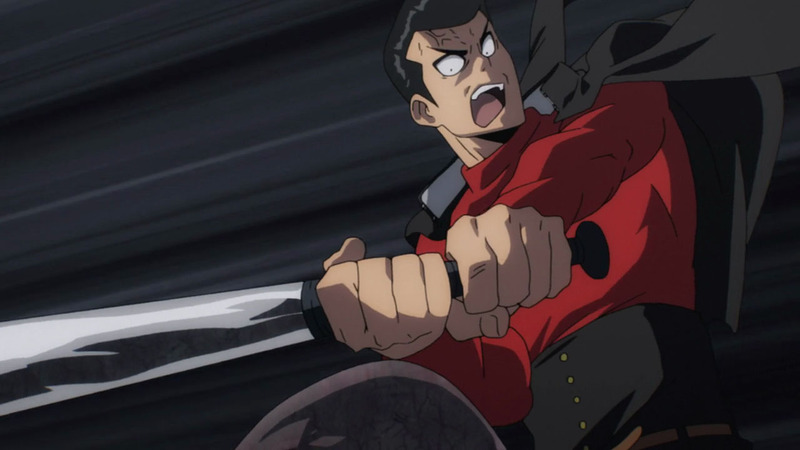 It was typical Saitama – being the awesome guy that he is… except there was one difference. He didn’t defeat Boros in one punch! For the first time, he was unable to instantly defeat his foe! I thought this would never come; it’s the name of the series, after all. But I’m glad that we were presented with a foe so strong that even Saitama can’t destroy in a single punch. And I’m glad the fight is carrying over into next episode rather than wrapping things up prematurely. There’s still one more opportunity to exceed the brilliance that was episode 9. While I was slightly disappointed with some of the S-Class heroes this week, don’t think I didn’t enjoy this episode, because I did! It was really, really fun. 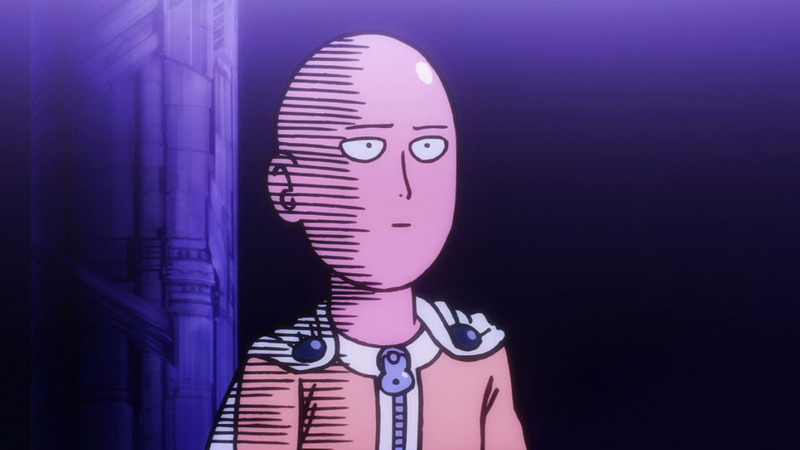 Saitama’s perfect reaction face was enough to love; that was the most I’ve laughed throughout watching One-Punch Man so far. With only one more episode to go – and several short OVAs – I’m excited to see what’s going to be pulled out the bag in the finale. It can only get bigger, better, and more explosive from here on out, surely? I guess they have saved the budget to the next episode, so the S-class heroes couldn’t use it (except for a moment that everybody remembers). It tells a lot of Saitama’s difference inpower to them. 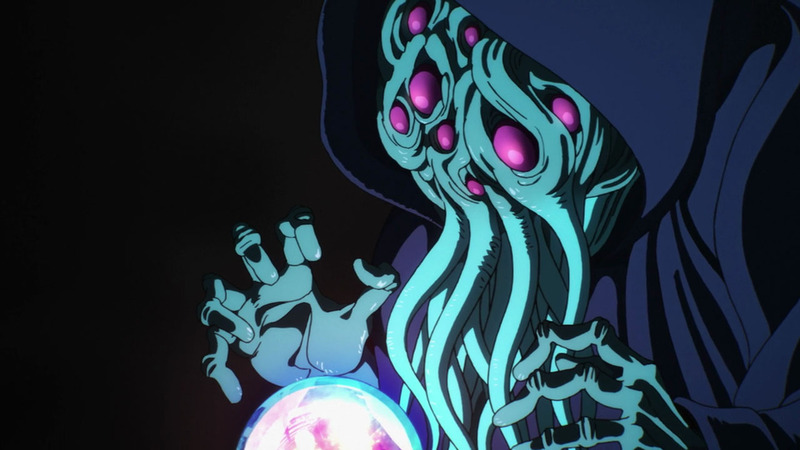 Goribas and the Octopus alien were on par with multi-head guy (who is fighting four S-Classes). A nice detail. 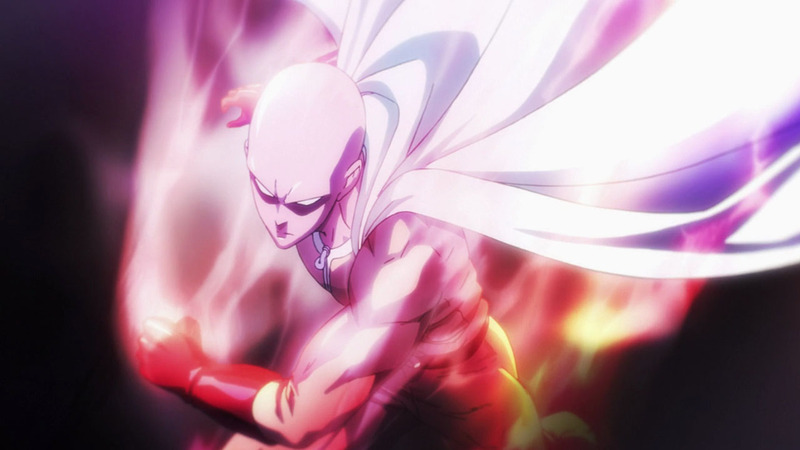 Boros’s clothes had the same colors as Saitama’s. i wouldn’t say save budget, but more like they sort of just sent less time on this episode. For those wondering, yes this episode was riddled with filler, at least 35%, part of which is probably because the show is ending so they wanted people to see past villains and heroes one last time. Well, you say that but, according to the artists working on the episode, they had a lot of cuts in this episode as well. Yes, 50 is a lot. I’m with all of you on the S class being underwhelming though. This is mostly because their fight in the manga was a lot shorter than this. Especially compared to how rushed all the other fights so far have been. I guess I’m just upset with them for eating up time that SHOULD have been dedicated to the pretty long and epic Saitama vs Boros fight. Wow this ep is really purple. Didn’t even notice until you pointed it out. And here lies the difference between Saitama and Boros, in how they handle their boredom. 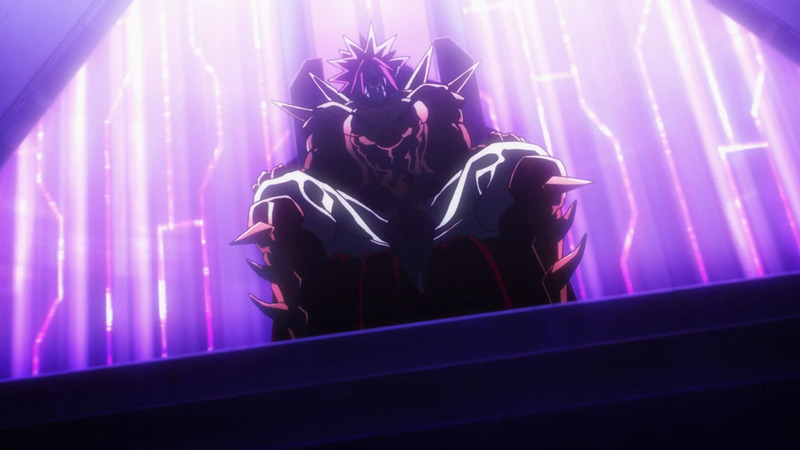 Had Saitama been a weaker or more aggressive man, Boros’s seat would have been his. See, this again makes me wonder. 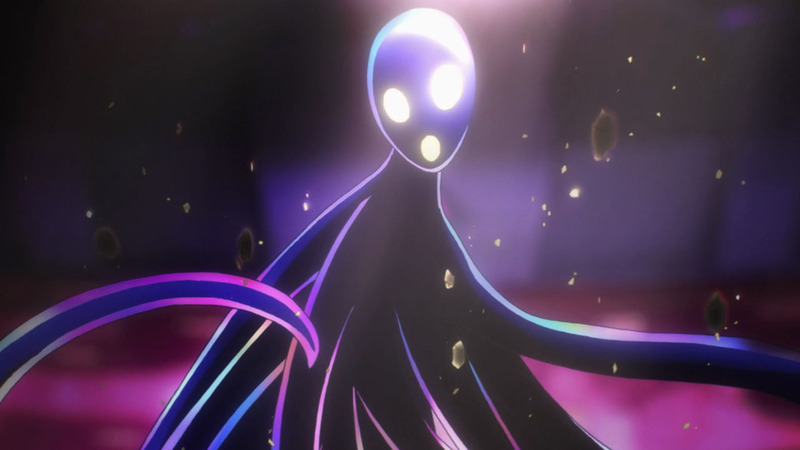 We know Saitama is ludicrously overpowered and can make some crazy strong monsters seem very weak. 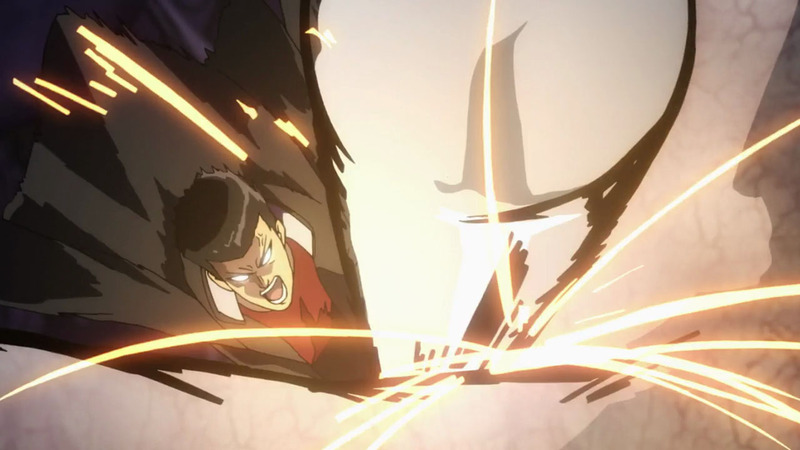 . .
Just how strong, really, was that Subterranean King from the first episode? 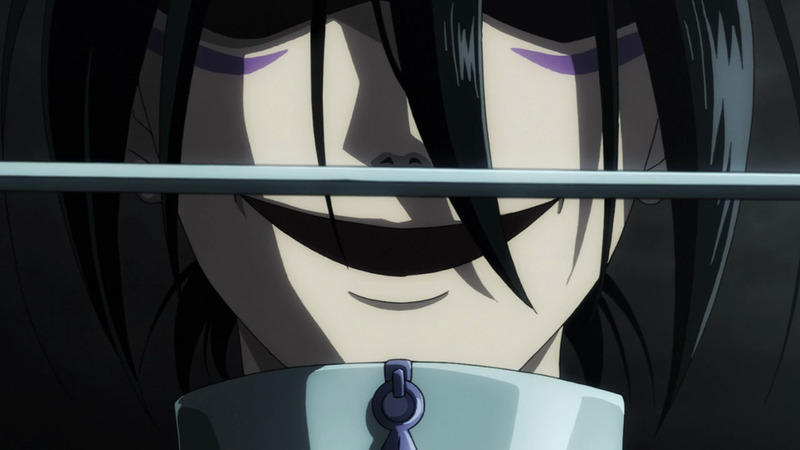 Imagine if that guy was actually as strong as the Deep Sea King. It is sort of implied the 3 Kings (Deep Sea, Subterraneanian and Sky) were all fairly comparable. The Sea King only looks the most impressive because he got to strut his stuff and show how powerful he really was. Subterraeanian King got wrecked immediately by Saitama, so didn’t get to do anything. While the Sky King got wrecked by our resident alien lieutenant, who is listed as a Dragon Level threat in the databooks. Was not this King in Episode 1, just an Dream? 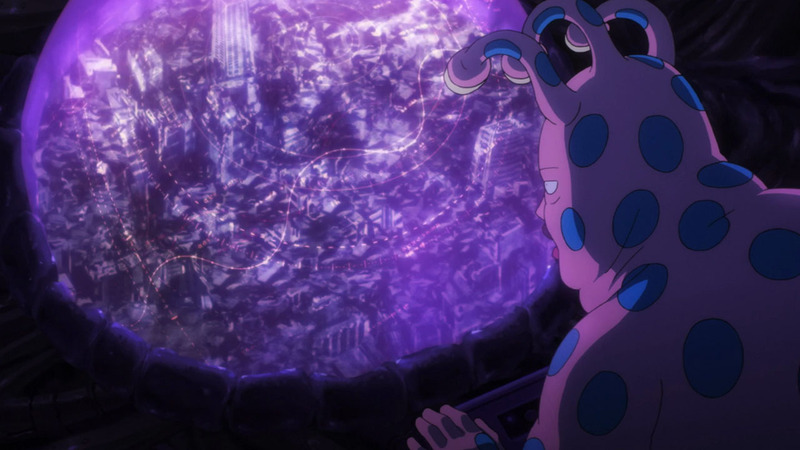 The dream sequence was just that, but the actual Subterranean king showed up after he woke up, and Saitama one shot him. Well, as far as two punches goes, I think his armour was destroyed in one punch, so that still counts as one punch? hammerhead took a punch also which just destroyed his armor, so it’s nothing new. And who can say he is not doing it again, being sympatetic with Boros? I hear ya Samu, I died when Saitama was goin “meh”. Actually the funniest things to me in this series are when Saitama just outright mocks the Shounen and Super Hero Industry and their Tropes. The S-Class heroes didn’t imrpess because, as they admitted, they are the “hit it hard” kind and nothing else. Probably Genos could have burned that monster into oblivion, but the others don’t have those kind of powers. Saitama doesn’t count, of course. The guy is so ridiculously powerful that attacks that should be weak against certain types work, no matter what. That’s part of the fun with him. And what about other limitations? Well, if he can’t fly, he will jump. And crash a ship if he feels like it. I thought they did okay considering they were up against a powerful alien that can regenerate regardless of how much damage it took. As soon as they learned its secret, they beat it pretty easily. asks “Are you stupid?” I’m thinking he didn’t intend to kill Boros. he’s always did his one-punch while or after an enemy has attacked. 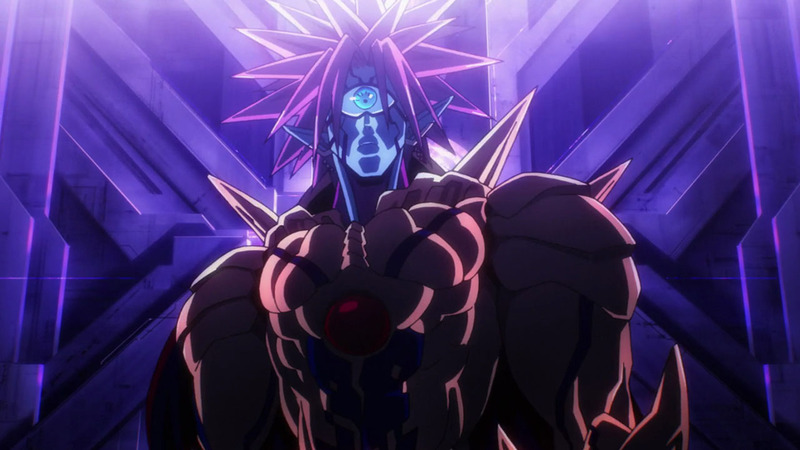 and Boros hasn’t powered-up yet. We don’t have enough manga to do season 2 yet. So sad. Why do you think that? 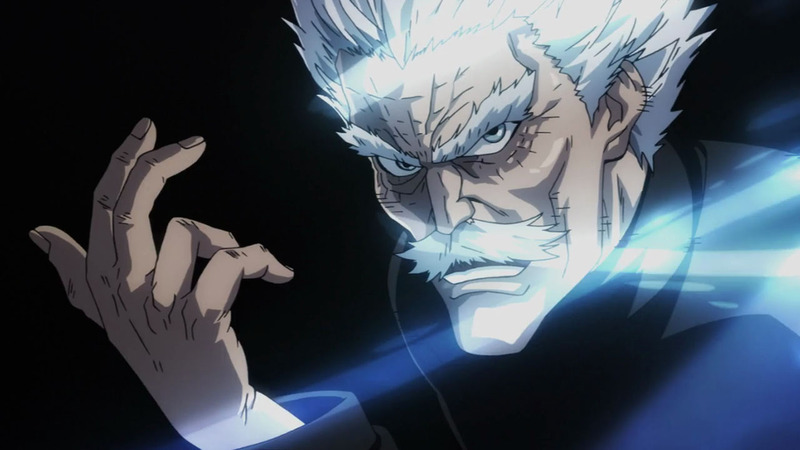 The Garou arc seemed to last for ages, that seems like there’d be enough there to last one cour. 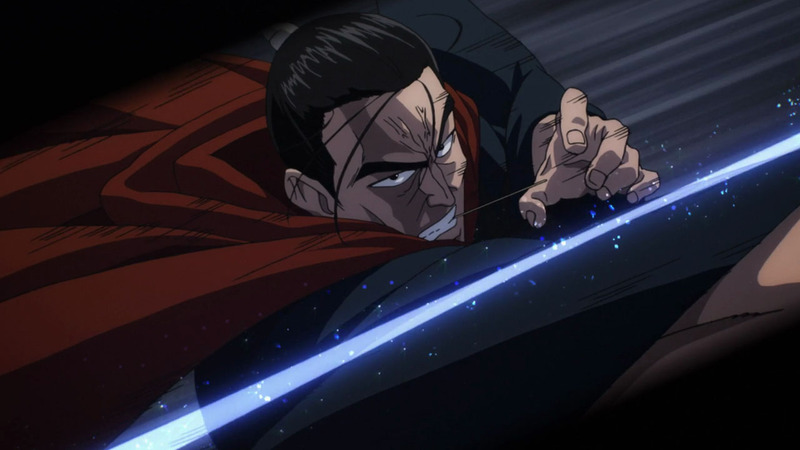 The anime is based on the Murata drawn remake of the web comic, and the remake isn’t close to getting through the Garou arc yet. I thought the same, that didn’t seem like a serious punch from Saitama. He also held back against Hammerhead in a previous episode and broke his armor. Well, for everybody who knows the manga. The finale will be good; considering he faces the only guy who can take a punch :) And very unlikely a season season. Anyway I loved how the C Class heroes, inc Mumen Rider wanted to help, even people behind the scenes can be heroes too! I thought that was a great thing for them to do, the situation was immensely dangerous, and I’m sure even looking for survivors is a life threatening thing in that situation. 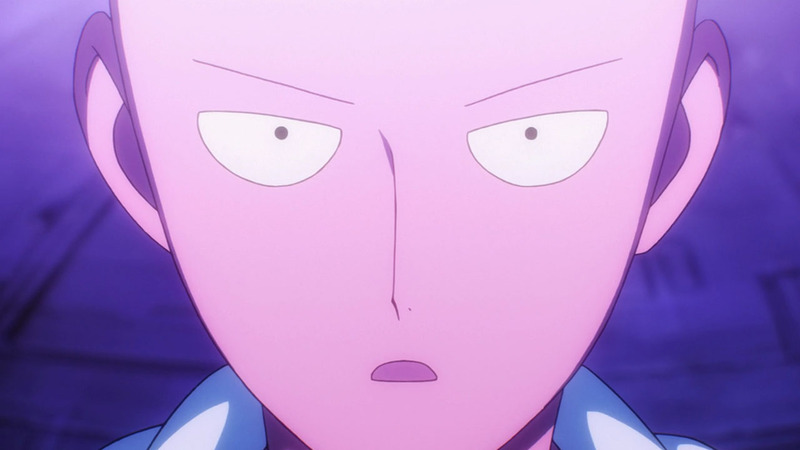 One little awesome detail that Madhouse added: Saitama kept his OK face even as rubble from Boros’s power-up was bouncing off him. 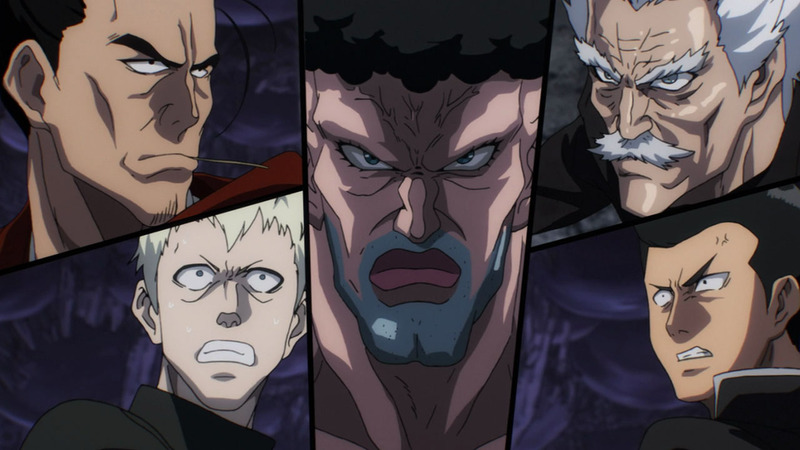 They have yet to showcase the other S-class heroes, and I like how they managed to incorporate the other ex-villains into this episode too. i.e. And Sonic looks like he will join the battle. 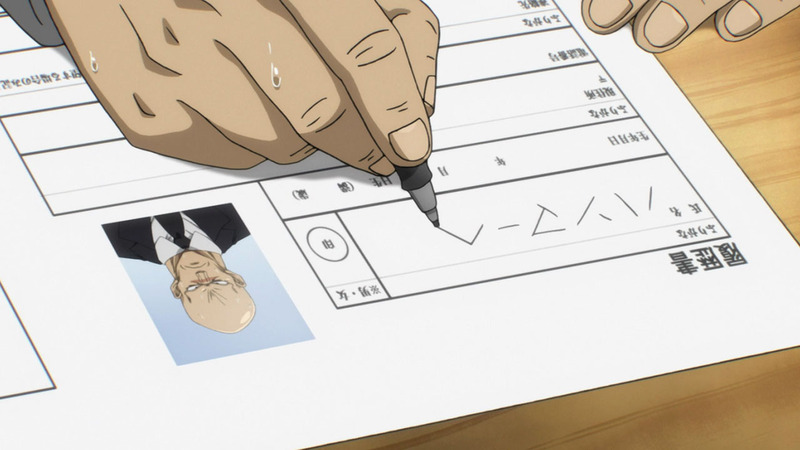 So I’m hoping all the characters will have another cameo in the last episode of Two Punch Man then. 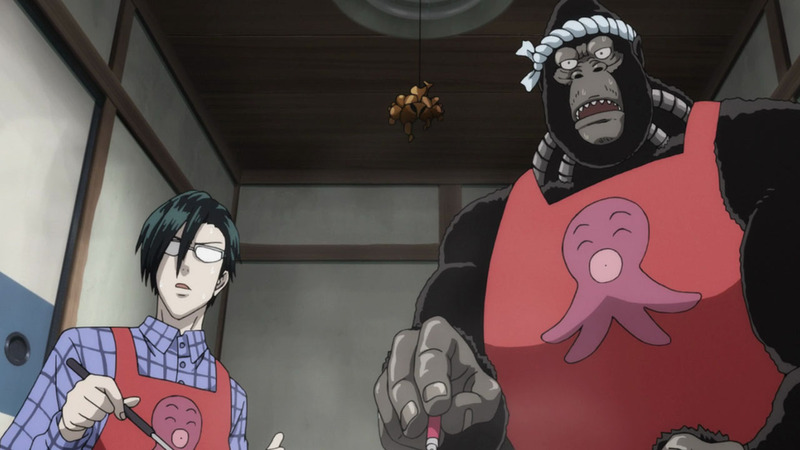 Fun fact: the House of Evolution becoming a takoyaki shop was showed only in the webcomic and pretty recently. Well done, MADHOUSE! I rate this episode OK/10. The s class fight looks drawn-out compare to the manga. I rather liked our S class hand to hand attack hero’s abilities. Impressive attitude and willingness to keep trying and then the seemingly most stupid of them figured out oh if I break this shiny piece it can’t grow back. 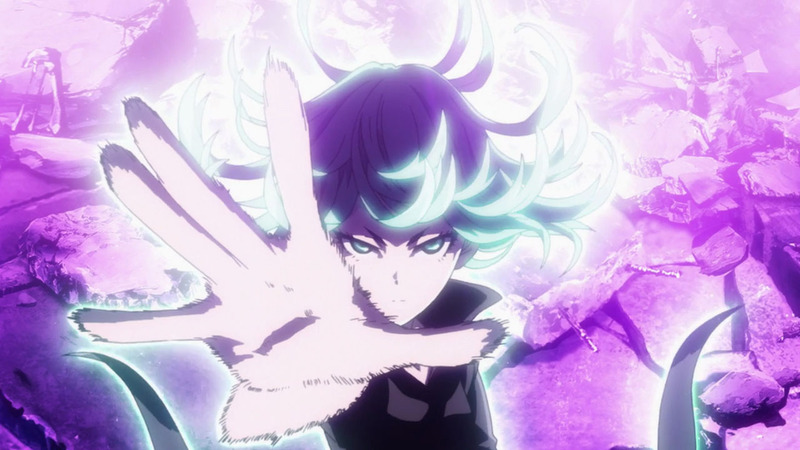 Tatsumaki to find out who could manipulate the environment more. Unfortunately he ran into god class One Punch. One thing I have started to really enjoy is the little kid pleasures of Saitama. In the really old, I’m 53, primitive stories where the hero never does face a real challenge they just show up to save the day. The other hero’s are there to show the more modern we tough but it a challenge type of fighting. Of course the fun of Saitama asking for directions, getting them and going the opposite way. 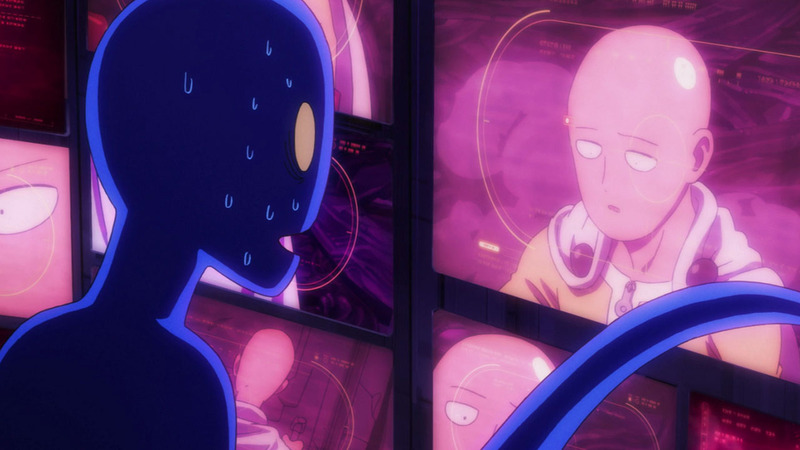 This show also shows the true nice and heroic nature of Saitama. 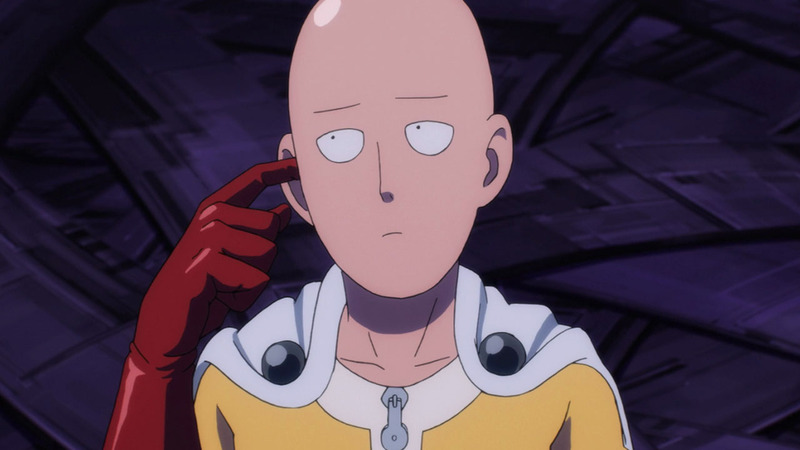 I had considered Saitama’s boredom problem easily solved if he went villain at least for a short bit. But here Saitama shows he does not consider evil actions acceptable at all and although he seams uncaring he really does feel the killing of people in City A a wrong to be fixed. 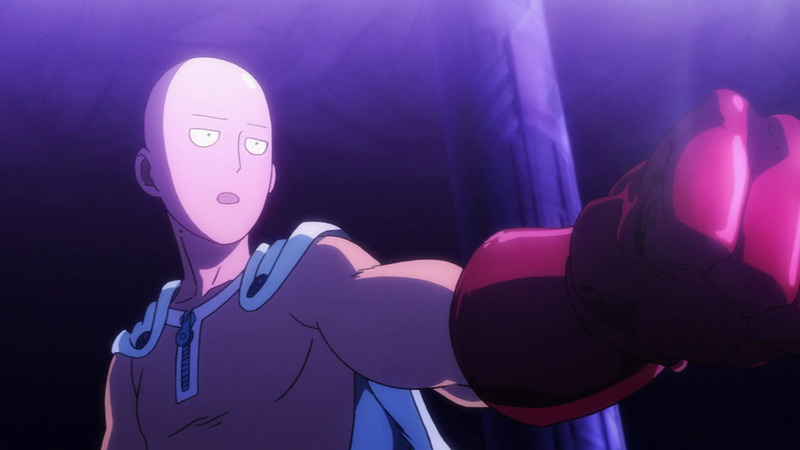 I belive Saitama hit the final boss left handed so yes not his strongest arm or swing. …I had trouble deciphering that. Ah thanks need writing criticism. I normally don’t write in bullet point fashion. Wonder if I could use Bullet points in this format. That would make it clear each break means I’m going to new topic. I normally write a way to long wall of text to attempt to avoid confusing and sometimes fail to be clear even then. 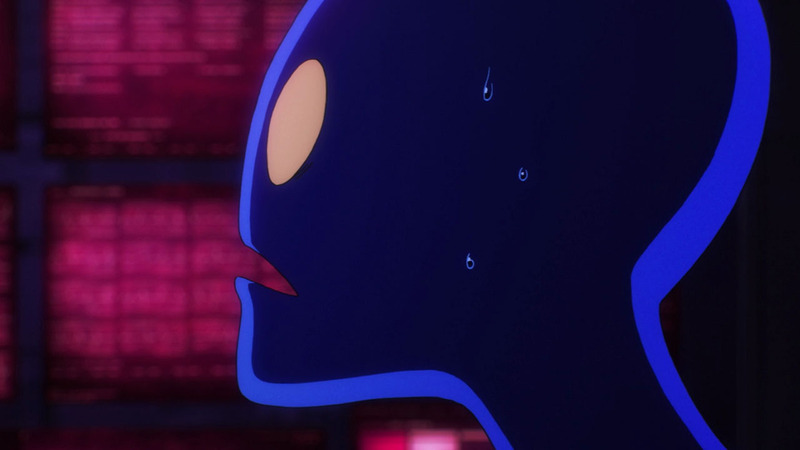 Tatsumaki was this episode’s one saving grace. And speaking of our green-haired commando, it never occurred to me before, but I wonder if she has a supposed god inside of her too, just like Saitama supposedly has. Are my deciving deceiving me!? A being so powerful that survived Saitama´s punch!? The question is not if the finale is going to be explosive, it´s if the Earth is going to survive a true clash of Titans!!!. the best reply in the world right now!!!!! My armor was holding back my final form! Behold!!!!! So does this mean you’re naked? 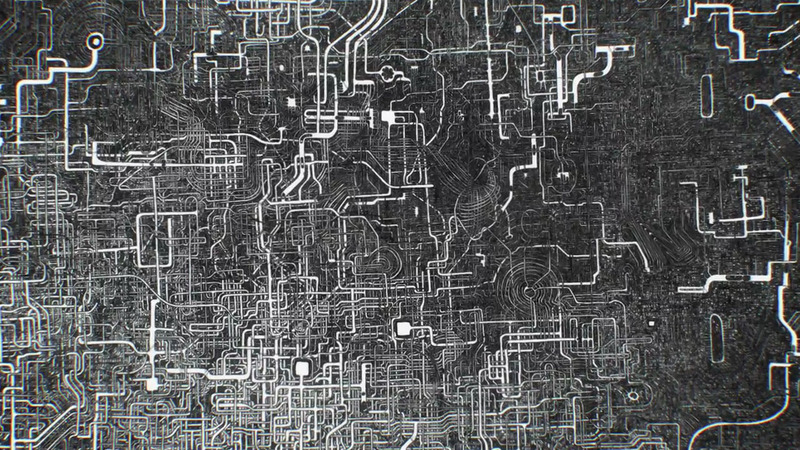 Anyone else catch the maze for the ship’s layout is that one that janitor created? Yes, it’s the same one. It’s finally time. I can’t even imagine the pressure that’s on Madhouse to get this fight right. If they pull it off, this will be one of the best single anime episodes ever. This episode was hilarious. Saitama just gives no f**ks. Him trolling the octopus guy and punching Boros first cracked me up. 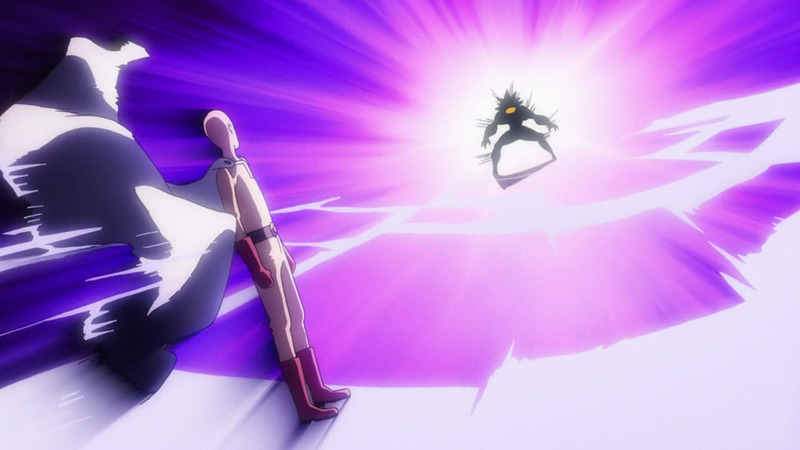 Finally we can see Saitama show off his power.. Or at least some of it. 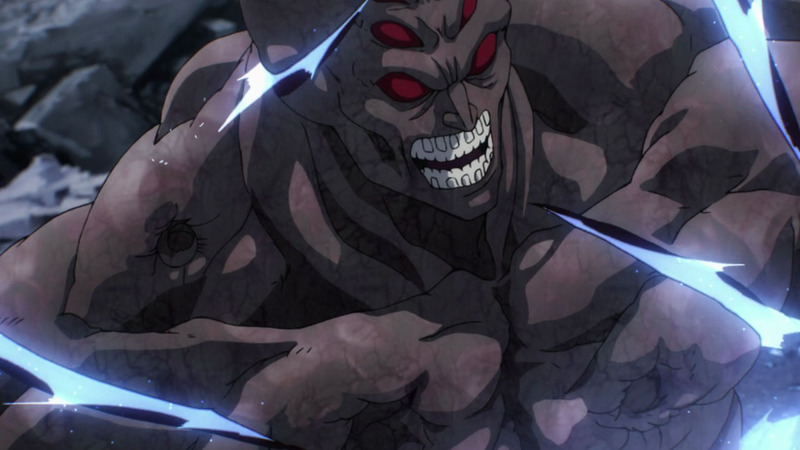 First one was the mosquito, second one was the spaceship (he gave it HUNDREDS of punches – and it still wasn’t down), so Boros is the third one he didn’t destroy with one punch. I don’t think he’s referring to inanimate objects, though. 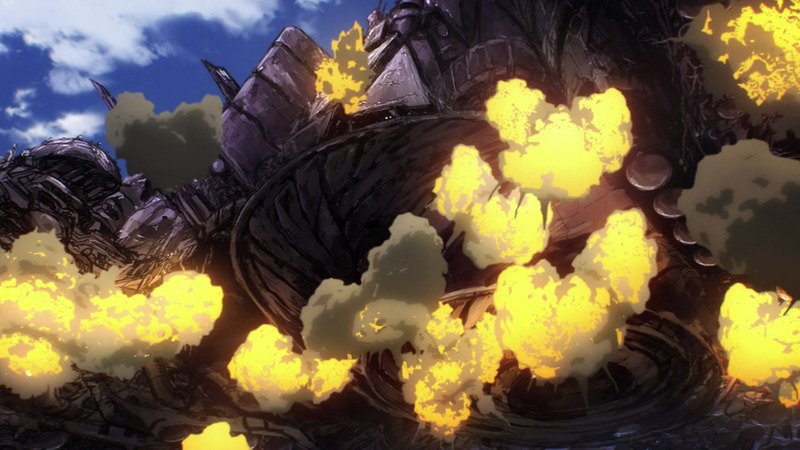 As for the mosquito, are you talking about the bug Genos was fighting in episode 2 by any chance? Saitama actually killed her with a single slap. that saitama wasn’t able to kill and that was driving him mad. Indeed he started chasing after that mosquito (with an insecticide) and in the process ended up meeting genos for the first time. Anyway I ain’t sure if that actually counts or if it’s just to be considered as a simple joke. Yeah, I wouldn’t count the mosquito as Saitama wasn’t really punching it. Excusing inanimate objects, I think this is his first time his punch hasn’t ended the fight straight away, which seems like a pretty big deal. Well… now that I think ’bout that… Hammerhead! 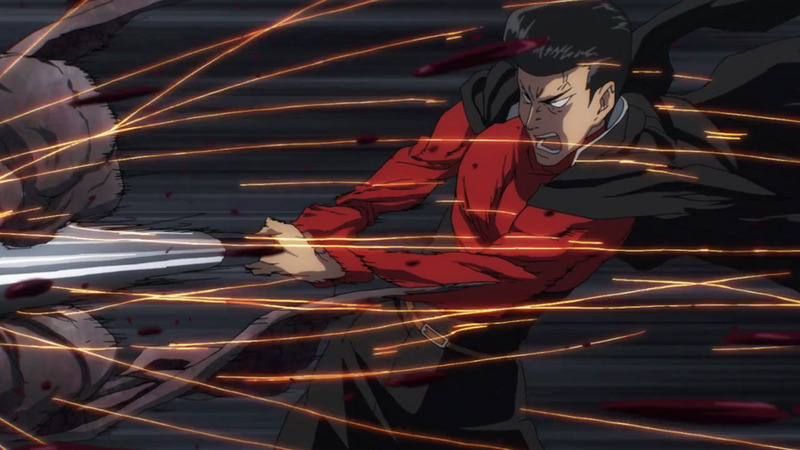 Saitama destroied his armour too without killing him! Saitama does have the selfcontroll to his strength and do can voluntarely punch sparing the opponent’s life. 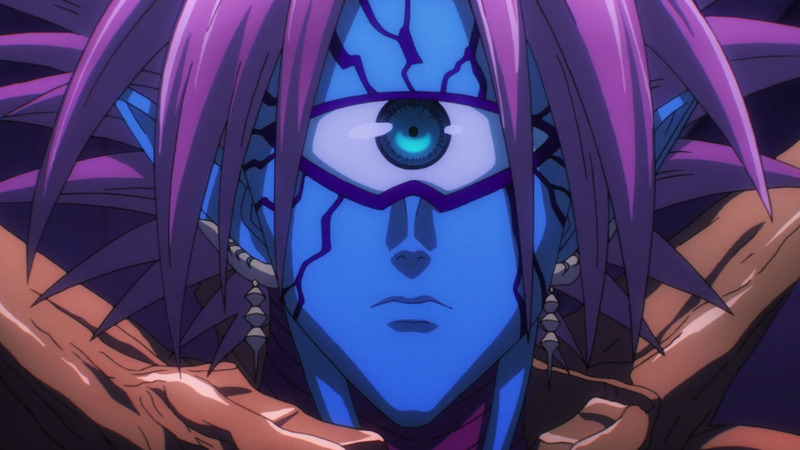 Besides he does not look surprised at all to see that boros did in fact not die. He looked surprised to me, just not absolutely shocked. Damn, I knew I heard that voice before but couldn’t tell whose character it was. Meruem huh, brings back memories. Ii to omou yo. I think Madhouse added a few scenes that I don’t recall in the manga to drag it out a bit for the finale episode, like showing Hammerhead, and the other previous villains that survived. 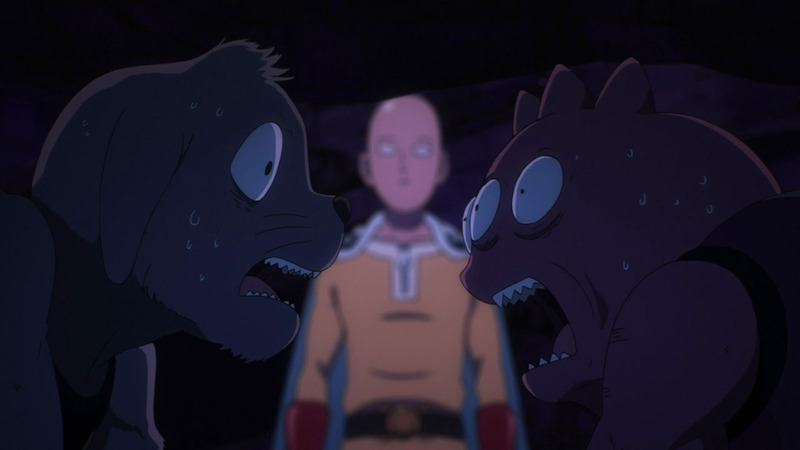 I also feel like they missed the comedic impact on the first “OK” when Saitama said it after Boros survived the punch. But I’m glad “OK” expression when seeing Boros transform was good :P Next episode should be really good, I think this fight is probably the most epic so far in the manga (at least the version drawn by Murata). I really can’t wait for next episode. But it’s kind of disappointing that its going to be last one. Really want to see more!! !